St Peter’s College was founded in 1929 by Francis James Chavasse, Bishop of Liverpool, and became a full College of Oxford University in 1961. The site, part of which was the medieval New Inn Hall, is bordered on the west by the line of the old city wall. 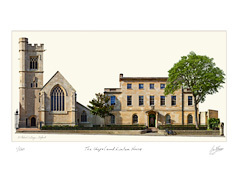 The entrance to the College is in the Georgian style Linton House – formerly a rectory but originally built as the offices of the Oxford Canal Company. The former parish church of St Peter-le-Bailey, built in 1874 by Basil Champneys, is now the College Chapel.